To help, we pulled together a list of moving and packing tips and tricks that will make your next living transition as smooth as possible. One of the best ways to make moving easier is to minimize the possessions you’re hauling from one location to the next. That means cleaning out the backs of closets, dusting off boxes in the attic, and tossing or donating anything that’s expendable. If you’re having trouble deciding what to keep or what to toss, be realistic about what will happen to that specific item in the next location. Will it continue collecting dust for another five years? In that case, kiss it goodbye! 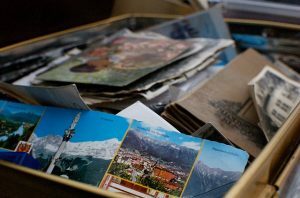 As you’re going through all of your clutter and deciding what to keep or toss, make a list of everything you decide to keep. Once the purge is over, then go through everything in your space and start to take inventory of what you have. You can then organize the list by grouping like with like, and come up with a packing strategy for each group. For example, you’ll want to ship your vases and breakable curios with the kitchen plates, cups, and glasses. Not only will this help with the actual move itself, but it will make the unpacking process much easier. A checklist like this will keep you on-task and prevent you from running around without a clear plan. Not all items in your household are equal in value. We’re not necessarily talking about jewelry or the flat screen TV (although those things are important to keep safe during the move! )—we’re talking about items with strong sentimental values. These items could range from a precious heirloom lamp, pressed flowers from your baby’s first day at the park, or the boxes of old photos stored in your attic. You’ll want to make sure these items get extra special treatment during a big move. Consider buying insurance for high priced items and take extra measures to correctly pack and ship anything delicate. In terms of old print photos, you’ll want to create digital back-ups of the originals. You can do this by sending them to us to scan. So, whether you’re moving away to college, buying a new home, or downsizing for a new space, the most important moving and packing tip is to have a plan. It will help you prepare for the work that needs to be done and ensure all your stuff arrives at the next destination safe and sound. Water Damaged Photos? Don’t Panic! This entry was posted in Blog and tagged moving, moving guidelines, old photos, packing, packing photos, photo scanning by Monika Jansen. Bookmark the permalink.